I've been noticing that OWH seems to always need generic Thinking of You or Missing You cards. So even though we're all busy preparing Christmas and other holiday cards, I thought I'd take a moment and create a simple Thinking of You to add to my next package to OWH. Sorry for the funky photo. I'm STILL working on that! I recently received a new stamp and die set from Papertrey called Floral Fusion 8 that was begging to get inked up. 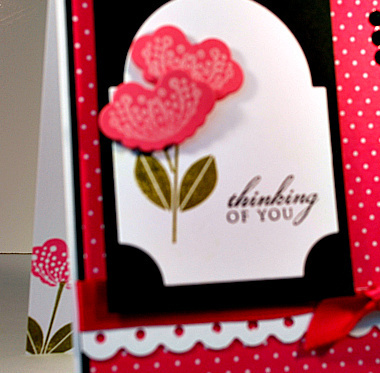 The set consists of a positive and negative flower, a stem and a couple of cute sentiments. For my card, I decided to use the both flowers and the stem. I die cut the flower shape in Hibiscus Burst, then stamped the negative floral image on the die cut in Fresh Snow. Next I cut a mat from white cardstock using Mat Stack 4, and stamped the stem in Ripe Avacado and the sentiment in black and matted with black cardstock. I attached the stamped die cut flowers to the stack with pop dots and set it aside. Next I matted a piece of Bitty Dot in Hibicus Burst in black, added a bit of white cardstock edged with a border punch, and tied on a piece of Hibiscus Burt Ribbon. 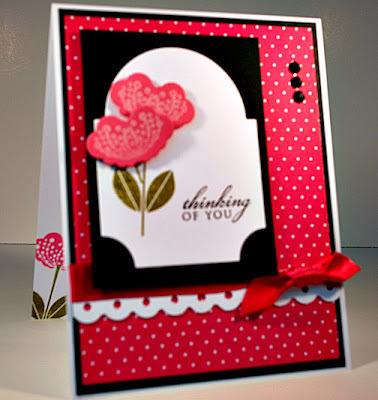 After attaching to a white card base, and adding the focal piece, I added three small black pearls and voila', a Thinking of You card is born! If you look closely, you'd see there's a flower stamped inside. I used the positive flower image and the stem to repeat the front motif inside the card. I like to do this when I can. I think it elevates an otherwise simple card to something a little more special. Do you decorate the inside of your cards? I'd love to hear what other ideas you have for making your cards just a little more special. Ok, that's it for me today. If you need a break from making holiday cards, why not try adding a few Thinking of You or Missing You cards to the stash? It's good for the soul! Very pretty card Kathy! I always try to include a good amount of everyday Thinking of You and Miss you cards in every box I send. I never stamp the insides of my cards but I almost always like the added touch when I see others doing it.